What is Filorga Time Peel? 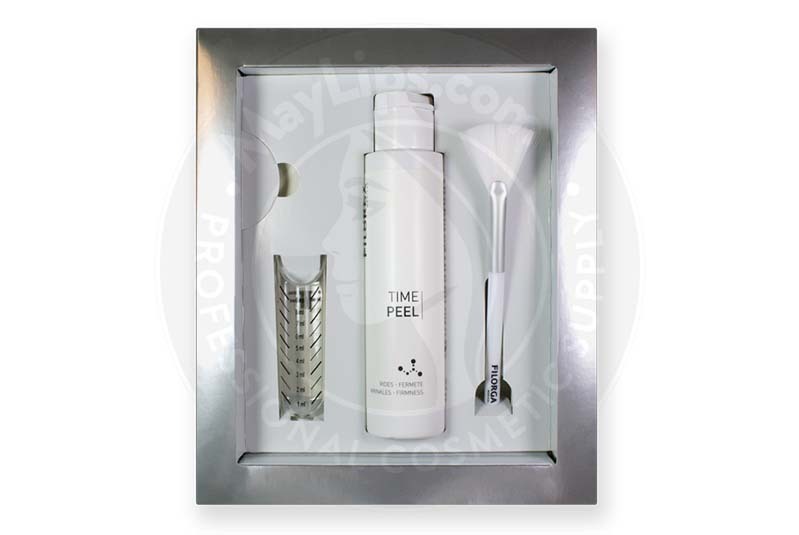 Filorga Time Peel is a professional-grade anti-ageing chemical peel that is designed for normal skin. This solution smooths fine lines and wrinkles, rejuvenates dull skin, and adds overall density to combat the early signs of ageing. Manufactured in France by Filorga Laboratories, each package comes with 1-100mL bottle of the peel solution, 1 dosing tube, and 1 applicator brush. Filorga Time Peel effectively reverses signs of aging by targeting dark spots and wrinkles, adding vitality to the treated areas, and giving a younger, more refreshed look. This is a great option for patients who are looking for a non-surgical, non-injectable solution for combating signs of age and fatigue. This chemical peel is used on normal skin to restore youthfulness to the skin by evening out dark spots and wrinkles caused by ageing. The specially formulated solution restores firmness and radiance by allowing the skin to regenerate new cells at a quicker rate. Filorga Time Peel can be used safely on the skin of the face, neck, and decolletage. After use, patients can look forward to firmer, more even, and smoother skin, restoring an overall healthy and natural glow. This product is a great solution for individuals looking for a gentle, non-invasive treatment to eradicate the first signs of ageing. How does Filorga Time Peel work? As the skin naturally ages over time, it loses density and starts to show signs of exposure from harmful elements such as the sun and other toxins. This exposure can cause the appearance of uneven dark spots, giving the skin a dull look. With the addition of fine lines and wrinkles, the skin on the face, neck, and decolletage can start to show signs of ageing well before the patient would prefer. Filorga Time Peel exfoliates dead skin cells and peels away the top layer of skin, getting rid of the cells that have been most harmed by age and environmental factors. At the same time, the chemical peel stimulates the growth of new cells, giving the skin a brighter, smoother, and more rejuvenated appearance. Filorga Time Peel is a medical-grade product that should only be administered by professionals who are licensed according to local legislation. Clinical testing has shown that the best method of treatment is to apply the product over 4 treatments, with each session administered 2 weeks apart. This treatment schedule has been determined to produce the optimal results. Pour approximately 2.5 to 3mL of the chemical solution into the dispenser tube, which comes in the package. To prepare the skin and to help balance its pH, apply a pre-peel solution, such as Filorga Pre Peel, to the patient’s skin using a compress or cotton pad. Apply the chemical peel solution to the treatment area using the applicator brush that also comes with the package. The product should remain on the treatment area for 3 minutes. Apply a solution to neutralize the peel, such as a post peel solution like Filorga Post Peel, using a cotton pad or compress. Finally, rinse the entire area using a wet cotton pad or towel. The entire session should not last more than 30 minutes. 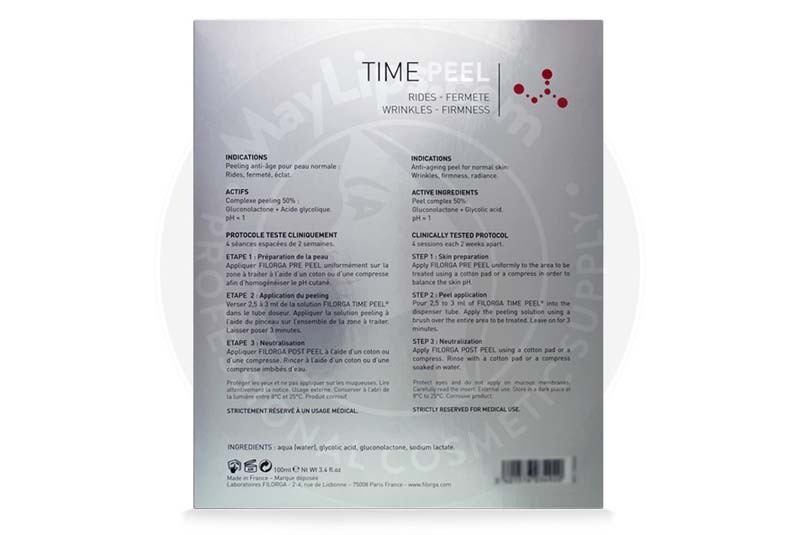 A peel of this nature is sometimes referred to as a “lunchtime peel” due to its speedy treatment and recovery time. Once all sessions are completed, the duration of results will vary person to person, though a gentle chemical peel of this nature typically lasts an average of 1 to 2 months. However, once all 4 initial sessions are completed, a maintenance treatment schedule may be considered to help the effects last longer. The longevity of the results will depend on many factors, including the individual’s age and lifestyle, as well as the condition of the skin being treated. There are some very mild risks associated with the use of Filorga Time Peel, such as the possibility of hypersensitivity or allergy. Prior to application, it is important to discuss the patient’s medical history and disclose the ingredients of the solution in order to decrease the risk of reaction. It is also important to avoid the eyes and mucous membranes when the product is being applied. Patients should also be advised to avoid sun exposure in the 2 days following treatment, and to apply a sunscreen with SPF 50 in the days thereafter. In comparison with other anti-ageing procedures, treatment with Filorga Time Peel is very non-invasive and is very low risk. Filorga Time Peel has some intended effects as well as some potential mild side effects associated with its use. As the purpose of this treatment is to exfoliate the top layer of the dermis that means there will be peeling of the skin. Other potential side effects are listed in the section below. Though this product may prove to be an effective treatment for many, there are some individual who should not use this production. The manufacturer lists a number of contraindications, advising that this treatment should not be used on individuals who: are pregnant or breastfeeding; have dark skin tones; are prone to hypertrophic scarring; have an autoimmune disease; have recently had skin surgery in the treatment area; have open wound in the treatment area; have recently undergone other aesthetic procedures such as laser therapy in the treatment area; have recently had radiation therapy; have temporary or chronic skin issues in the treatment area, such as eczema, psoriasis, inflammation, infection, herpes simplex, or herpes zoster; have used irritant medication such as retinoids; or have a hypersensitivity or allergy to any of the listed ingredients. 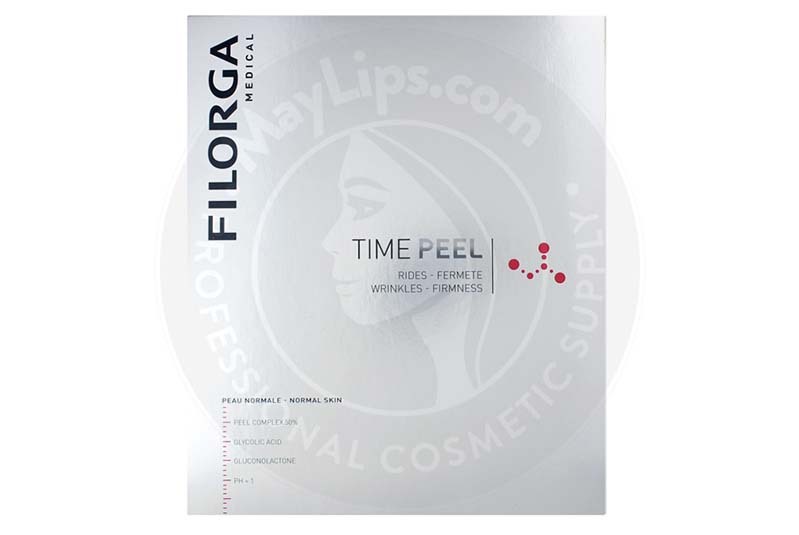 Filorga Time Peel is composed of Gluconolactone, Glycolic Acid, Sodium Lactate, and water. The solution has a pH of 1 and a peel complex of 50%.